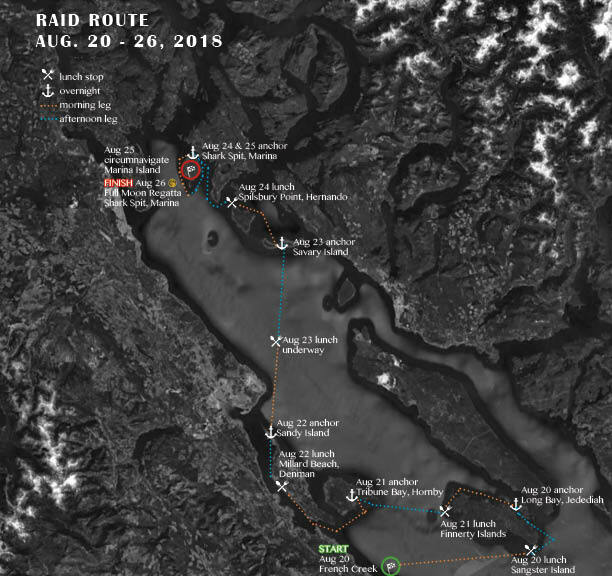 The Barefoot Raid will cover 110 miles, in 12 legs, over seven days of racing through the Salish Sea, in coastal B.C. The fleet will be accompanied by a mothership. Boats will raft up, or beach camp for the night, and meals will be served aboard. There will be both a racing class, and a cruising class, and will be open to all boats over 12′, up to what can be legally transported on the highway. Most legs will be open to a combination of rowing/sailing/ pedaling/paddling, while some will be strictly sailing, and others only rowing/pedaling/paddling. French Creek, Vancouver Island, B.C.- Shark Spit, Marina Island, B.C.